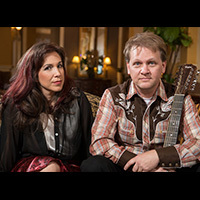 dizzybloom was formed in Austin in March of 1995 by Billy R. Preston, Juliet Gamero and Stacey Evans. Steven Oakes joined the band as a permanent member in May of 1996. After a year of off-and-on recording at Congress House Studio in south Austin with producer Mark Hallman, the self-titled debut album was released in May of 1997. Over the course of the next 12 months the band played shows constantly in cities such as Dallas, Houston, San Antonio, Lubbock, College Station, San Marcos, and of course, Austin, Texas. They had over a dozen radio interviews, had several record reviews in newspapers and magazines throughout the state. dizzybloom played their final show at Liberty Lunch in Austin, May 28, 1998. Juliet went on to finish her master's degree in music at UT Austin, and has held faculty positions in two different universities in Montana and in Utah. She continues to teach piano lessons to all ages and she raises four children with Billy in Utah. Billy obtained a master's in Forestry in Missoula, Montana, and currently holds a supervisor's position with the US Forest Service in Utah. Steven obtained a second bachelor's degree in computer science, to go along with his bachelor's in business from UT Austin, and eventually took a job with the Hewlett Packard Company in the Dallas area. Stacey continued to pursue her musical career in Hollywood after a brief stay in Boise, Idaho. She released a solo album A Slender Thread in 2005 and still writes, records, performs in Los Angeles. In December 2010, Billy, Juliet and Steven met at the Congress House Studio in Austin, Texas, to record four brand new original songs along with an Aerosmith cover ("Dream On") to be included on an upcoming EP release for April 2011. This meeting would mark the first time since May of 1998 that these three musicians have recorded any music together. Wiley Koepp of the Austin band Scorpio Rising sat in on drums and Ashley Glover of Austin band Dn'A sang all vocals. Mark Hallman assumed the role of producer once again. The title of the 5-song EP is Heroes for Ghosts and will be darker, moodier and a bit on the heavier rock side than anything previously released by the band. The songs are longer, more complex and draw heavily on inspirations from 70's classic LPs: Pink Floyd's Dark Side of the Moon, Led Zeppelin's In Through the Out Door, Rush's A Farewell to Kings, and Yes' Fragile.